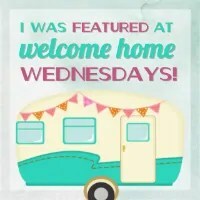 Welcome to Welcome Home Wednesdays #38!!! Everybody ready for Mother’s Day? What are your traditions? I get breakfast in bed and then usually a trip to the nursery to pick out some flowers to make the yard pretty and colorful..then the hubby plants them all 🙂 I do not have a green thumb. Thank you for stopping by and Happy Mother’s Day to all of you! Thanks for partying with us, Jelica! You have such great projects! Thanks Erin for hosting another great party. I hope you enjoy your Mother’s Day (it sounds awesome) and all those pretty flowers. Thank you for linking up, Mistie! We appreciate you stopping by! Have a lovely Mother’s Day too! Thank you for hosting! Happy Mothers Day! Thank you for coming over, Marilyn! I hope you have a wonderful Mother’s Day too! Thank you, Ilka, for taking the time to link up! Appreciate it! Thanks for the party Erin! Happy Wednesday! Thank you for partying with us, Katrin! Have a great day! Thank you Erin, for featuring my Marshmallow Flower Cupcakes along with these other great features. Thanks for hosting! Thanks for the link party, Erin. Thanks for coming by and partying with us, Debbie! Thanks for the party Erin. Thanks for linking up with us, Sadhna! I don’t have any lentil recipes on the blog..yet! I love lentils! Thanks so much for featuring my chalkboard plant markers! Thanks so much for hosting this fun party and for featuring my chalkboard plant markers! You made my day 🙂 Have a wonderful week! You did a great job! Thanks for linking up with us! Have a wonderful week! Erin, thanks to you and the ladies for hosting! Hope you’re having a wonderful week and wishing you the happiest Mother’s Day! Of course! Thank you for stopping by! Happy Mother’s Day to you! Thank you for hosting the party. Have a great Mother’s Day weekend! Hi Mandy! Thanks for linking up and joining us! Have a great weekend! Good Thursday Morning! Its almost Friday! Thanks for hosting this great party. See you next week.